Corporate Accommodations is proud to be a part of the North Carolina community. We love to support local organizations that help to make a positive impact in our communities and also educate our customers however we’re able to. North Carolina is an awesome state to live in, but, at times, can experience harsh weather conditions such as hurricanes and extensive amounts of rain. Rather than risk losing all of your personal belongings, squaring away renter’s insurance will likely save you roadblocks and headaches down the road. Keep in mind, there are several renter’s insurance options that can be as cost-effective as $20.00 per month! Does renters insurance cover damage to an apartment? More often than not, temporary housing apartments have insurance that covers any physical damage done to the building. While this is important and essential, it leaves your personal belongings susceptible to burglary. Your clothing, furniture, electronics, and other personal belongings will not be automatically covered by insurance without providing yourself with renter’s insurance. This is an aspect of temporary housing that is often underlooked and unknown. Along with your personal belongings, renter’s insurance also becomes handy when it comes to liability coverage that has been caused by negligence. For example, let’s say you turn your shower on and then accidentally fall asleep- you could be liable for damage if your shower’s water overflows into your neighbor’s apartment and any medical bills that have resulted from the incident. Other forms of renting inconveniences include but are not limited to extensive water damage, vandalism, theft, power surges, and fires. Renter’s insurance could potentially cover all of those expenses leaving you free of hassle! On the other hand, renter’s insurance often does not cover flood and hurricane water damage, mudslides, lightning and thunder incidents, nuclear hazards, earthquakes, or other natural disasters. If you feel as though you’re susceptible to one of these disasters as a temporary housing renter, it is recommended that you take necessary action to square things away with an insurance professional. It is imperative to have a solid understanding of the limits your renter’s insurance will cover each type of property. For example, your electronics could be covered by up to $5,000, but your clothing and jewelry could only be covered by up to $500. There are specific limits of coverage you can set by working with an experienced insurance adjuster. There are also add-ons available to your renter’s insurance that could cover additional articles of personal property: expensive pieces of art, expensive home theatre equipment, and instruments would be a few prime examples. Corporate Accommodations would also recommend looking into an aspect of renter’s insurance entitled ‘loss of use’. Loss of use would provide next-step support the building you live in were to catch fire or if something were to happen that would deem the building unlivable. The next-step support typically includes but is not limited to food, hotel, and transportation expenses that would accrue during the time of the inconvenience. In regards to liability coverage, bodily injury is an aspect that is imperative to understand. A few examples of liability-related cases would include cooking food that one of your guests claims they develop food poisoning from after ingesting and an instance where your pet snake bites one of your neighbors while you’re both at the neighborhood picnic area. When asking yourself “Is it necessary to have renter’s insurance”, the answer is clear here- Yes it is necessary! How much is renter’s insurance? As mentioned before, renter’s insurance generally has several different offering and add-ons. If you have many expensive pieces of property in your apartment that are added onto an insurance plan, expect to pay a fair amount of money on a monthly basis. On the other hand, if you only have a few valuable personal belongings and opt for one of the most basic insurance plans, you could pay as little as $12-$160.00 per month! Again, we advise studying up and utilizing insurance professionals as resources in order to determine the best option for you. Yes, property owners and landlords are able to require renter’s insurance in the state of North Carolina. Corporate Accommodations does require renter’s insurance with the renters’ best interest in mind! We insist that coverage of renters’ insurance ranges from $50,000-$80,000. We do offer our own insurance, though it may not be the best option for a renter, as damage incurred at the fault of the renter would not be covered. If you have any questions regarding insurance options, please let us know! We take pride in guiding and educating others to the best of our ability. Contact Your Corporate Housing Company Today! 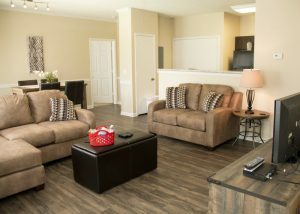 Corporate Accommodations specializes in affordable – contemporary housing solutions that are spacious and comfortable with more privacy and security than you will find in a typical hotel. 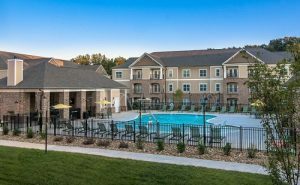 We offer amenities in Greensboro, Winston-Salem, High Point, Burlington, and surrounding areas. We pride ourselves in sales and customer service staff to take care of all your corporate housing needs and solutions. If you manage or handle temporary housing for your company, Corporate Accommodations offers ways to make your life easy. We take pride in educating our customers however we’re able to and would love to hear and renter’s insurance-related questions that you may have! Be sure to contact us today to receive your free quote by calling us at 336-299-1312 or by filling out the form below! We were very impressed with your company. We plan on giving out referrals should others need corporate furnishings. I was greatly pleased with my apartment. Everything was up to date and the apartment really made for an easy transition while away for work, from my family. The ladies who helped me were so professional and helpful. Greatly impressed with the accommodations, people, and prices! They did a great job and I loved the beautiful apartment they furnished. We had a wonderful time in our temporary apartment. Great location and the place was better than we expected. Really appreciated all the support the Corporate Accommodations folks gave us. Strongly recommended. I had a three month contract for work in Winston-Salem, and was worried about trying to find a place when I had never been there. Their team worked with me and our HR rep to find me a great community that was right near the greenway that I could run on. Made my stay in town more enjoyable.